"Where are you?" ... "Missing ?" ... "Long time no see busy ?" ... "No new posts, what happened?" ... aah friends I am feeling special and humbled by all the attention received from you. Thank you so much for all your kind words and messages. Now what had happened and why I was missing from here. With series of events happening on personal front I opted to stay away from blogging and social media for some time. The vacation time was scheduled with two main events, firstly my elder son's thread ceremony. The function went well. After the function the next event in line was his participation at International Spell Bee competition so you see the whole focus was on him. Happy to share with my readers that he got selected as Budding Star at the competition among 97 students and received a trophy as well as cash prize in dollars. After this event it was time for our return. Though we had scheduled our holidays to be little longer than previous ones but with these events it went by very quickly making it a memorable one. Post vacation after resuming routines at home and at work, I realized there was some imbalance and not able to finish my work in time. This made me step back and analyze what had caused it. Things at home were not in place and it dawned on me to opt for declutter lifestyle. As Barabara Hemphill has said " Clutter is nothing more than postponed delayed decisions". How true.. yes I have been postponing those decisions leading to a stressful routines, so decided to devote my blog time to sort and set things in order. Created space by becoming minimalist. Gave some of the toys , books to friends and other unused things were diverted to charity. 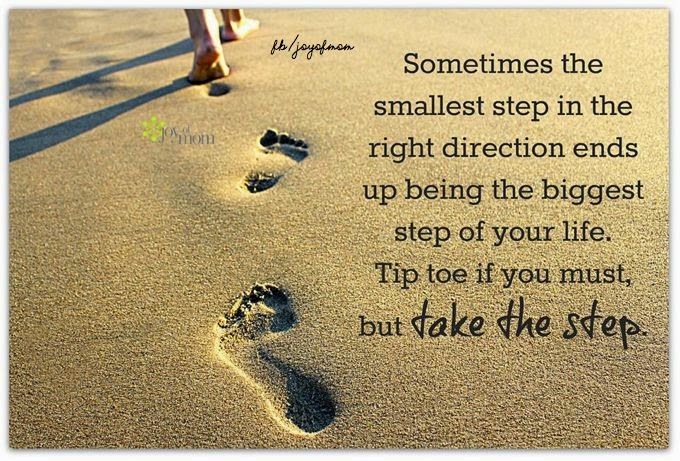 I am happy I took the step and feeling happy and relaxed. So friends what next? Am I done with this or still it will keep me away from blogging? The answer is I am back to the space that is very dear to me ,,, with a hope that it will not interfere in my clutter maintenance schedule [to stay organized] and this in turn gives me some time for blogging ~ a virtuous cycle you see :). Probably you would see less posts but I won't keep myself away from posting recipes. With many recipes lying in my draft for sometime now [the ones I had cooked before vacation], I decided why not publish them one by one. 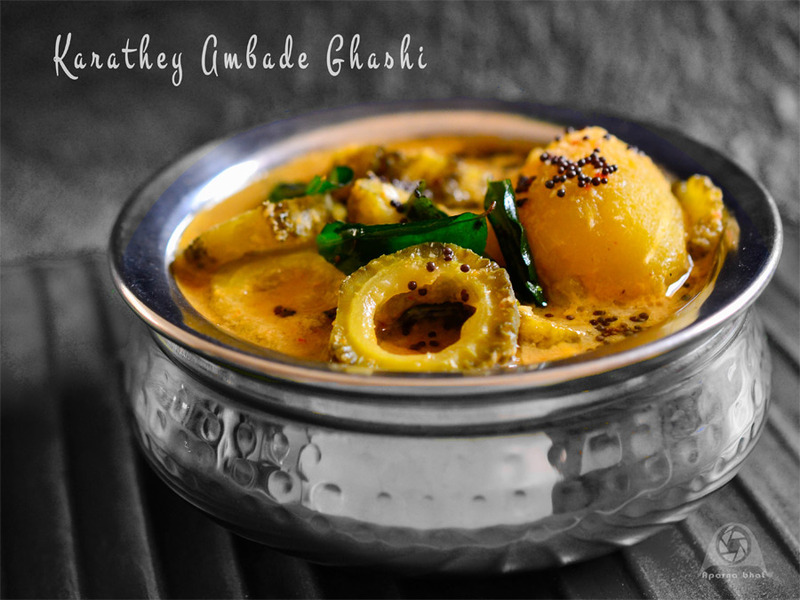 So here is the recipe of curry 'Karathey Ambade Ghashi' from Konkani cuisine prepared with bittergourd and hogplums [ambado]. I was reminded of this curry when one of my friend SVS, posted her preparation. I adapted her recipe to suit family preferences. 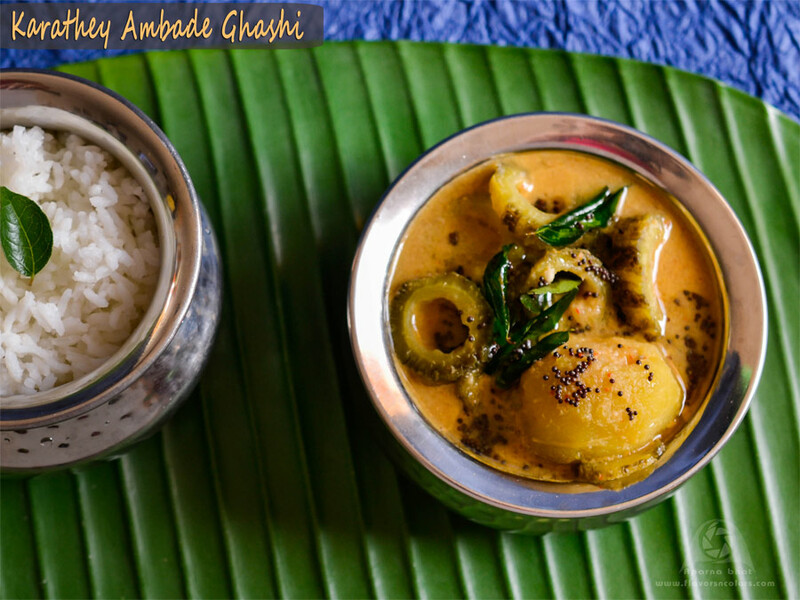 This curry tops the menu during festivals mainly Ganesh Chaturthi. The taste is a mixture of tikshe [spicy], godshe [sweet] and amshe [sour/tangy]. Ambades/hogplums being a seasonal vegetable I was lucky to get hold of some in frozen state from my family friend before she left for India vacation. Ambades are added to get the sourness. If you don't find them you may also add raw mangoes but make sure that you add less of tamarind. Wash the bittergourd and ambades. Scrape of outer skin of bittergourd lightly and slice them into roundels. Apply salt and keep it aside. After 10-15 mins squeeze out the juice. Peel the skin of hogplums and crush them. 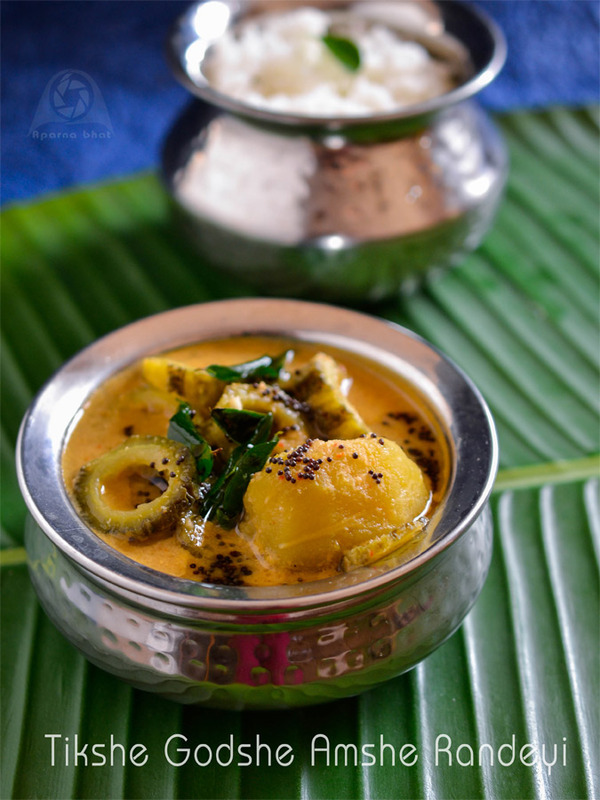 Cook bittergourd and hogplums together in little water and once half cooked, add salt and jaggery and continue cooking. Meanwhile in a tsp of oil fry fenugreek seeds, coriander seeds, urad dal, red chillies separately. Allow it to cool and grind it with coconut, little tamarind [you may skip tamarind if the hogplums are very tangy] to smooth paste. Add the paste to the cooked vegetables. Add water to adjust the consistency and jaggery if required to adjust the flavors inorder to suit your palate. Bring the curry to boil. Switch off the flame and prepare seasoning with mustard seeds and curry leaves. Pour it on the curry and cover the vessel with lid for 2 mins. Serve this curry with steamed rice. Would like to take the opportunity to pass my Ganesh Chaturthi wishes to all of you. May Ganpati Bappa shower his blessings on you and your family forever. Welcome back Aparna. I actually checked your space yesterday to see if any new posts. Hope you had a wonderful holiday..